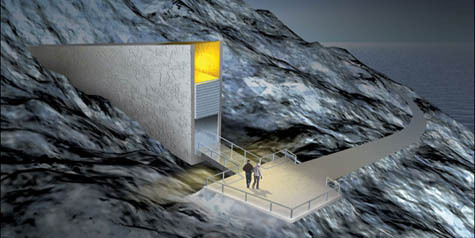 [Image: A rendering of the "doomsday vault" by Statsbygg; via the BBC]. Last year, New Scientist reported that "a large concrete room, hewn out of a mountain on a freezing-cold island just 1000 kilometres from the North Pole," might represent "the future of humanity." 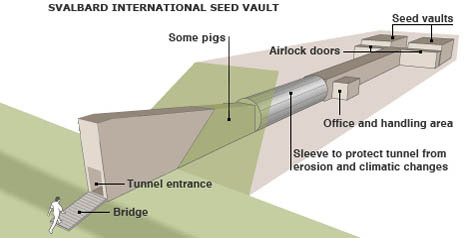 That "large concrete room" is the now somewhat infamous "doomsday vault" in which seeds from all of the world's known crops and plantlife will be stored. The vault – described as "the ultimate safety net for the world’s most important natural resource" – will be constructed "deep inside a sandstone mountain lined with permafrost on the Norwegian Arctic island of Spitsbergen. The vault will have metre-thick walls of reinforced concrete and will be protected behind two airlocks and high-security blast-proof doors. It will not be permanently manned, but 'the mountains are patrolled by polar bears'," we read. 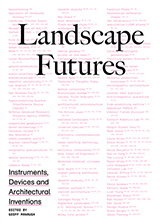 In choosing a location and determining other key physical parameters for the project, its designers "ran drastic climate change modelling scenarios, projecting 200 years into the future and factoring in potential increases in water levels due to melting ice from pole to pole." Well, as the BBC reported yesterday, the final design for the vault has been unveiled. [Image: Inside the vault, rendered by Statsbygg; via the BBC]. This complex, pictured above, will now "safeguard the world's agriculture from future catastrophes, such as nuclear war, asteroid strikes and climate change. Construction begins in March, and the seed bank is scheduled to open in 2008." 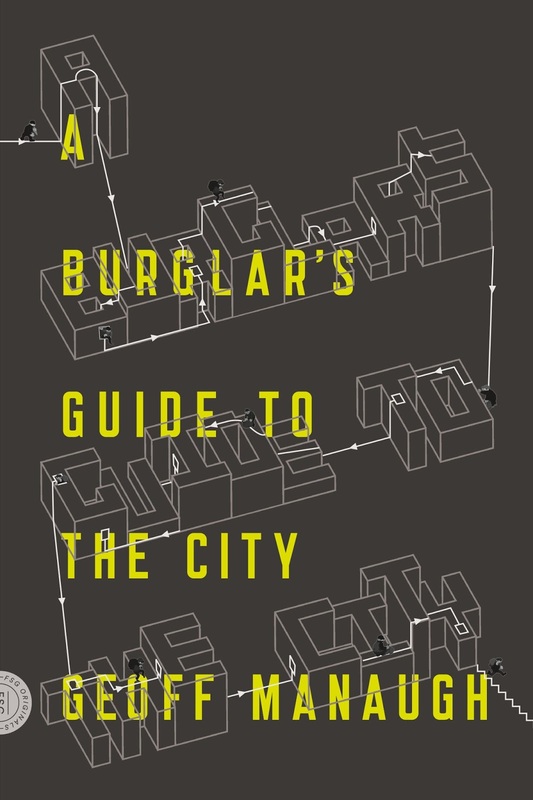 Thus, a whole new building type has quietly emerged into architectural history – update your textbooks. Vitruvius would be proud: it's the botanical Arctic Ark-archive. But is Spitsbergen really that safe? Perhaps these seeds should really be stored on, say, the International Space Station? Leaving aside how it would be possible to retrieve them, in the event of a truly global catastrophe, the premise nonetheless reminds me of China's "space seed" project – which seems to have all but disappeared from public discourse. Plant seeds have been blasted into orbit in the hope that "space breeding" holds the key to improving crop yields and disease resistance. Wheat and barley strains developed by the Department of Agriculture and Food in Western Australia (WA) have just landed back on Earth following a 15-day orbital cruise on board China's Shijian-8 satellite. "Space-breeding refers to the technique of sending seeds into space in a recoverable spacecraft or a high-altitude balloon," said Agriculture WA barley breeder Chengdao Li. "In the high-vacuum, micro-gravity and strong-radiation space environment, seeds may undergo mutation." Surely this must herald the birth of the most interesting era in garden design since Versailles? Cultivating "a number of new species" through genetic interaction with the universe? Or is that the plot of a Donald Sutherland film? After all, we read, China may have "nearly 405,000 hectares of rice fields planted with space seeds and 8,100 hectares of space vegetable growing. An estimate of 243,000 hectares of space rice fields will be added this year." Is this being taught in landscape design courses? Or, more germane to this post: will these space seeds be stored with the rest at Spitsbergen...? (Last year on BLDGBLOG: Seeds of the Apocalypse). Glad you noticed that... Spent time on that, I did. i forgot to say, "on the subject of gene arks, my favorite story is hayao miyazaki's comic book series nausicaa of the valley of the wind. it is even more relevant now, because i doubt the seed vault is protected against giant shiva robots." And here I had hoped they would handle this earth plantlife backup issue like was done in the sci-fi classic movie 'Silent Running' instead. That would definately be...err...cooler. Kinda sounds like Bruce Dern is in charge of this method too though. 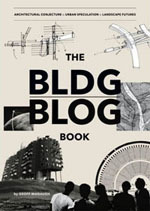 Very cool blog. I'll be back to digest all of this more. I love architecture. Pigs? Something must have gotten lost in the translation! or maybe the pigs are there to feed the polar bears. perhaps, in a semi-non-ironic-human-obliterating asteroid collision the master Earth Dumpling one's ideas come to cosmic fruition?